Have you ever gone into a person’s home to visit and noticed that one of the pictures on their wall was just a little crooked? In fact, you may have wondered if the homeowner even recognized it. The longer you look at it, the more crooked it appears and the more you wonder how it can go unrecognized, and uncorrected, by the owner. You’re left with one of two choices. You can either say something, or just go over and straighten it out on your own. Every carpenter knows how important a plumb line is among all his tools. It is a weight on the end of a string that, when applied to a wall, ceiling or section of cabinets helps him confirm if they are actually straight, or slightly bowed. If it is not straight, then the carpenter must correct the condition so it meets the plumb line and is “true”. That is, it conforms to the measure and standard of “straightness”. 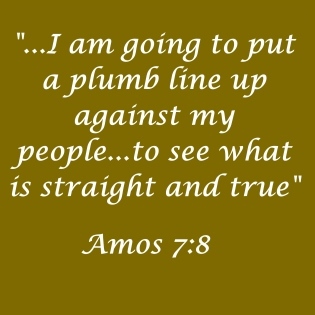 God’s Word is a plumb line. He uses it to measure whether His people are “true” to His standard, or if we’ve gotten out of alignment with them. Many times in Israel’s history, they read the Word of God and realized that they were not doing what it required of them. The Letter of James in the New Testament tells us to be “doers of the Word, not just hearers of it.” We must measure our lifestyles according to the Word of God and be sure to make whatever changes necessary to conform to what it says. Jesus is the Ultimate Plumb Line. The Apostle Paul tells us that the Holy Spirit helps us to come to the fullness of the measure of the stature of Christ as we yield our lives to him on a daily basis. We are being made to “conform to the image of His Son.” God uses people, circumstances and various situations to shape and mold us into the image of Jesus. He is always shaping us; shaving off the crooked parts of our lives; rounding the edges in a loving process that cannot be avoided. So, how shall we then live? Let’s look into God’s Word and be sure we’re actually living according to it. Let’s determine to make whatever changes need to be made, at whatever the cost, to be sure we’re living up to God’s Standard.